The idea originated in Canada in the 1950s. As the first flower of spring, the daffodil was chosen by the Canadian Cancer Society as an ideal symbol, representing hope, a new beginning. . . something positive and life-affirming that could be used to raise awareness and funds amid the “winter” of cancer. The American Cancer Society followed suit in the 1970s. Other cancer charities in Australia and Ireland adopted the daffodil as their symbol in the 1980s. These charities could never have imagined the bright yellow flower would become a symbol of hope in a more practical way. Daffodils contain alkaloids that exhibit potent anti-cancer activities. But it turns out ancient medicine was already on to something. While modern scientists are only just discovering the medical properties of the daffodil (Family, Amaryllidaceae, genus Narcissus), the fabled Greek physician Hippocrates advocated using a pessary prepared from daffodil oil for uterine cancer around 400 BC. Other Greek physicians were still using this tumor therapy over 500 years later. Daffodil oil was also employed as a topical treatment for cancer by Roman physicians as recorded by Pliny The Elder in the first century AD. The practice spread to North Africa, China and Arabia in the Middle Ages. Pliny actually described 16 medical uses for narcissus including the treatment of burns, wounds, sprains, and contusions and blows inflicted by stones. He also said it could be used to soften skin indurations (a hardening of the tissue), and to warm parts of the body that have been frostbitten. The amaryllidaceae family is very large, boasting more than 1100 species, containing at least 300 structurally diverse alkaloids isolated so far. Many of these alkaloids were used in traditional medicine for centuries to relieve cough, asthma, convulsions and allergies. Daffodil bulbs were pounded and turned into pastes for application to wounds. Poultices treated burns, joint pains and gout. The bulbs and flowers were considered effective remedies for hysteria and epilepsy. One type of amaryllidaceae alkaloid is used in mainstream medicine today for the treatment of early stage Alzheimer’s disease. Daffodil compounds have also been studied as a treatment for depression. Other alkaloids in this family, together with their derivatives, have been found to be sources of anti-bacterial, anti-viral, anti-fungal, and anti-inflammatory properties. In short, it’s quite a flower. 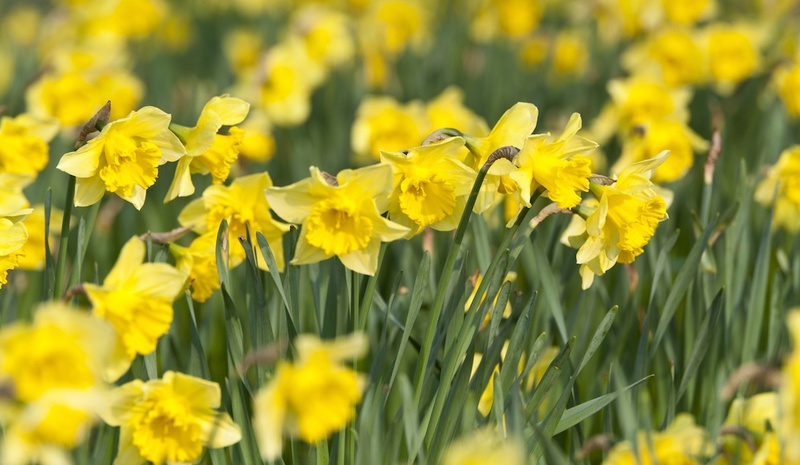 Four alkaloids isolated from daffodils have demonstrated strong anti-cancer activity. These are pancratistatin, lycorine, narciclasine, and haemanthamine. Pancratistatin induces apoptosis (cell death) in numerous cancer cell types by targeting the mitochondria while having no effect on healthy cells. This was demonstrated in human lymphoma cells, two human breast cancer cell lines, melanoma, leukemia and metastatic prostate cancer cells. Lycorine has multiple biological functions. It’s described by researchers from China as having “strong pharmacological effects on many diseases, including anti-leukemia, anti-tumor, anti-angiogenesis [prevents growth of tumor blood vessels], anti-virus, anti-bacteria, anti-inflammation, and antimalaria” yet has very low toxicity towards healthy tissues. Lab studies demonstrate multiple inhibitory properties towards many human cell lines including large and non-small-cell lung cancer, colon carcinoma, breast adenocarcinoma, ovarian carcinoma, esophageal cancer and two types of leukemia. Narciclasine also exhibits potent anti-cancer activities, especially in experimental brain tumor models including gliomas and metastases. This alkaloid, too, was found to be free of toxic side effects. Gerald Weissman, MD, is Editor-in-Chief of the FASEB Journal, which published a study on narciclasine. He commented, “Scientists have been digging in odd corners to find effective treatments for brain cancer for decades, and now they’ve found one in daffodils. Researchers from the Czech Republic found the alkaloid showed strong cytotoxicity against colorectal adenocarcinoma cells. Alexander Kornienko from Texas State University is part of a collaborative team of 25 researchers from four continents devoted to developing treatments for cancers that resist conventional therapies. He and his research group have been particularly interested in products isolated from daffodils. Several years ago he said lycorine, narciclasine and haemanthamine work mainly, they believe, by rigidifying the actin cytoskeleton in cancer cells. The actin cytoskeleton is the main factor that determines a cell’s shape, internal organization, mechanical support, movement and division. One of the three filaments that make up the cytoskeleton is the protein called actin. A cell’s structures are like the bones, ligaments and muscles of the body, with the actin part of the cytoskeleton being the muscles. When a cancer cell looks to migrate, it has to change its shape so it can squeeze between other cells, move out of tissues and into blood vessels. To muscle its way out, it uses its actin cytoskeleton. By making this filament rigid, the daffodil alkaloids prevent the cell from moving freely, migrating and dividing, ultimately leading to its death. Professor Kornenko and 11 of his colleagues published new research in the journal Structure in March. Their article laid out, for the first time, a molecular explanation for the anti-cancer properties of haemanthamine. Protein synthesis is essential for cancer cells to grow and spread. Cell organelles called ribosomes are crucial for this process. These are the Achilles heel of malignant cells. Tumors will not be able to survive if the ribosomes are prevented from functioning normally. The research group showed that haemanthamine binds to part of the ribosome, preventing production of new proteins. In addition, it prevents the nucleolus within the cell nucleus from manufacturing more ribosomes. A series of events then follows. A stress response within the nucleolus is triggered, causing the immune system to activate an anti-tumor surveillance pathway. This leads to stabilization of the critical tumor suppression protein p53, which in turn inhibits tumor growth and promotes cancer cell death. As yet, there have been no human studies on these powerful alkaloids. People who might be tempted to eat daffodils to gain the benefits need to realize that parts of the plant are highly toxic. The anticancer compounds are extracts, not the whole daffodil. This might seem farfetched, but in the UK, where daffodils are very popular, 12 people a year become ill from eating the plant, and 27 people contact the National Poison Information Service about daffodil poisoning. In 2015, a government health body even urged supermarkets to keep daffodils away from the produce aisles because it’s an “emerging risk”. The director for health protection at Public Health England, Professor Paul Cosford, wrote: “Each spring, stores such as yours provide a wide selection of flowers, particularly cut daffodils and daffodil bulbs. So unfortunately we’ll have to wait till safe, effective extracts have been validated in human tests and made commercially available.